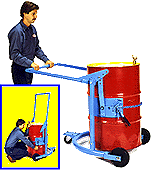 80A Mobile-Karrier Steel 55-gallon drum 22.5" diameter between ribs 95 Lb. 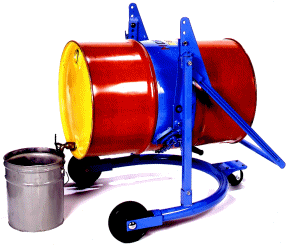 (43 kg) 41" x 36" x 9"
80AM Mobile-Karrier with spark resistant parts Steel 55-gallon drum 22.5" diameter between ribs 97 Lb. 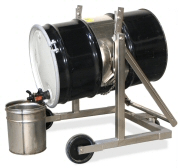 (44 kg) 41" x 36" x 9"
80APS Mobile-Karrier for 55-gallon plastic or steel drum 55-gallon plastic drum 22.5" to 24" (57 to 61 cm) diameter, 34" to 36" (86-92 cm) tall. Also standard steel 55-gallon drum. 97 Lb. 21" to 23" (53.3 to 58.4 cm) diameter fiber, straight wall steel, or cylinders (includes 55-gallon steel drum) 97 Lb. 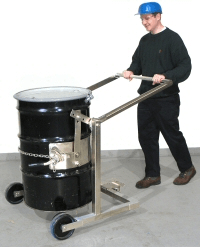 Drum Carriers / Dispensers - Mobile-Karriers to raise, transport, rotate, tilt and drain a heavy 55-gallon drum.